When we see ancient sculpture in museums, we’re generally faced with beautiful white marble and green bronzes. It’s difficult to imagine that these objects were once part of a colorful world where marble was painted and bronze patinated (surface-treated) to produce more naturalistic colorations. Bronze sculptures were cast from different alloys of copper, tin, and lead. Following their useful life (over 2,000 years ago! ), they were abandoned and buried in a variety of environments including rivers, oceans, and underground. To add to their stories, many bronzes discovered hundreds of years ago were restored according to the tastes of the day. Ancient bronzes, therefore, have a range of colors that have less to do with their original use and more to do with how they survived through time. These colors and so-called “burial patinas” have value in themselves, testifying to an object’s antiquity. Today, ancient bronzes have burial patinas with a range of colors including red-browns, browns, greens, blues, and even black. 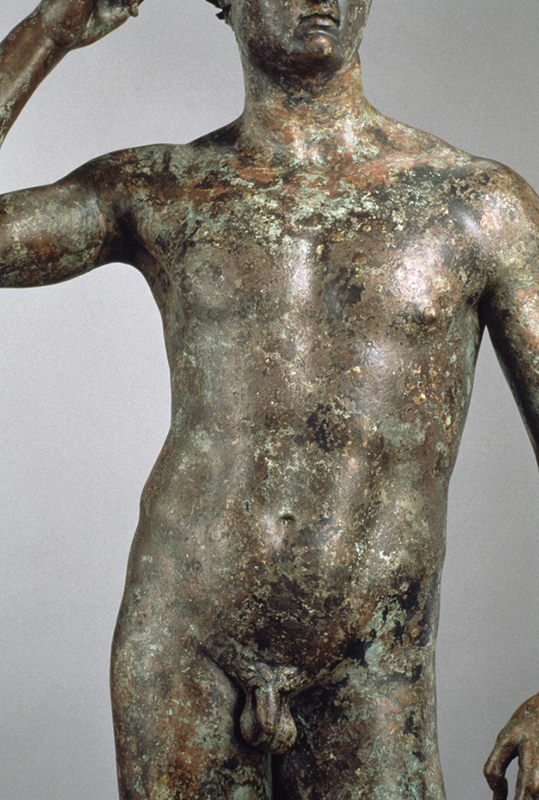 As examples, the bronze shown above from the site of Vani in the Republic of Georgia buried in a sandy soil has an even pale blue patina, while the Victorious Youth shown below, a sea burial, has a variegated patina with a range of colors. Bronze surface coloration and alteration was understood even in ancient times. Roman historian and writer Pliny distinguished between two types of patinas. Aerugo nobilis (stable bronze, or rust), today termed “noble patina,” was stable and enhanced surface appearance. Virus aerugo (vile or virulent patina) was destructive and disfiguring. We use similar terms today. The colors we see on ancient bronzes today are mostly a result of copper oxidizing to form red-brown cuprite, green malachite, and bluish azurite. Although some metallic bronze core may remain, the surface gradually reverts to its original state as an ore, reducing the metal content. In addition to being colorful, patinas sometimes preserve details of the original surface layer of the bronze sculpture—such as the original surface contours and evidence of surface tooling such as polishing, chiseling, and scraping. In the past, restorers would often remove surface oxidation layers in a mistaken belief that the surface had to have a metallic appearance to truly be representative of “bronze.” However, today we know removing these layers can also eliminate much of the surface detail, and we conservators employ much less aggressive cleaning methods. In fact, we seldom clean to the point that we reveal metal. Copper burial patinas are generally chemically stable and confer some protection to the object. 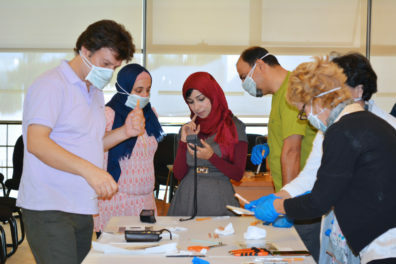 In some instances, however, they may be unstable (“vile”) and present continued preservation issues in both storage and display. 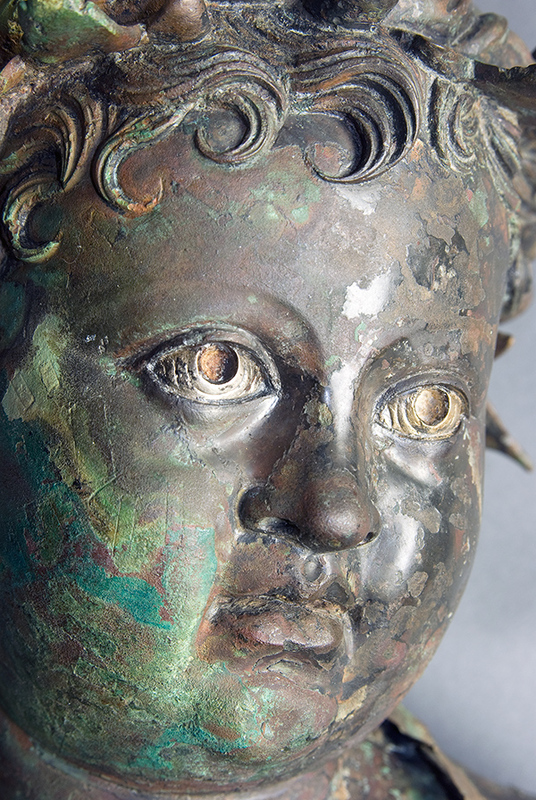 Conservators work to identify particularly problematic bronze objects and prevent further deterioration. As I noted above, chloride salts and copper do not make a good combination, and the “bronze disease” cycle may be activated if unstable bronzes are stored or displayed at humidities above 40%. 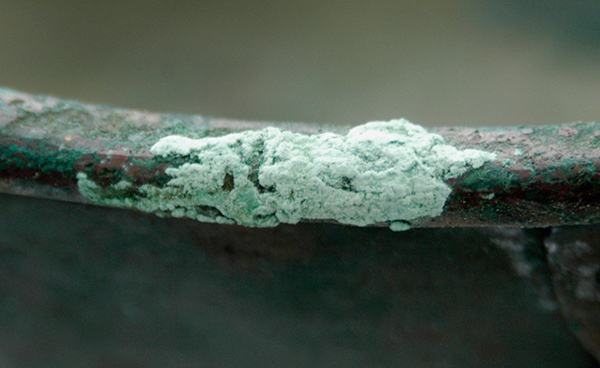 Copper corrosion may appear as powdery, pinhead-size blue-green deposits or be more scattered. So what can be done? Conservators can carefully soak salts out, treat copper alloys more generally with chemical corrosion inhibitors, or treat them with spot methods. Coatings may also reduce the ability of water to react with the copper salts. Perhaps the most effective treatment of all is prevention. 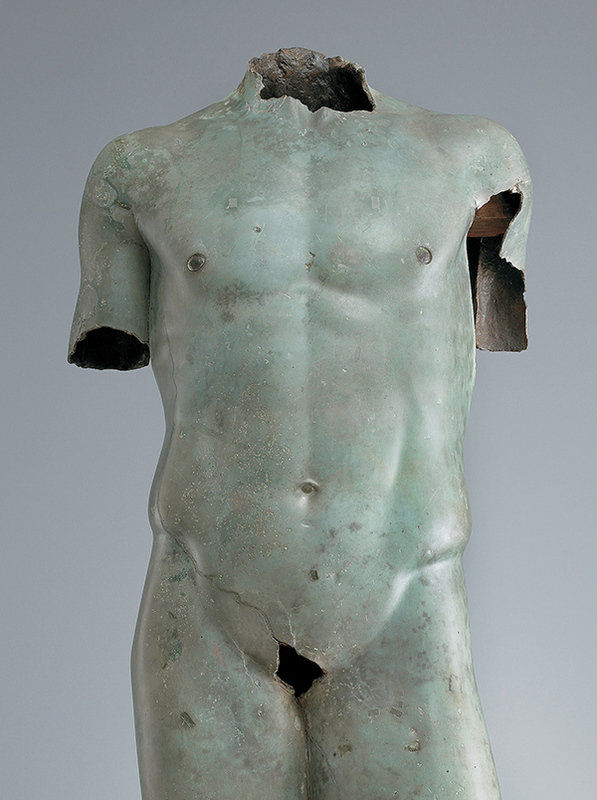 Keeping unstable bronze sculptures in low humidity—as in several displays of the exhibition Power and Pathos: Bronze Sculpture of the Hellenistic World—inhibits the chemical reactions that cause damage in the first place. My work as conservator in the Antiquities Conservation Department at the J. Paul Getty Museum involves a variety of ancient materials. In addition to technical studies of gold and silver objects in the collection, I’ve worked on several bronze sculptures on loan to the Museum. 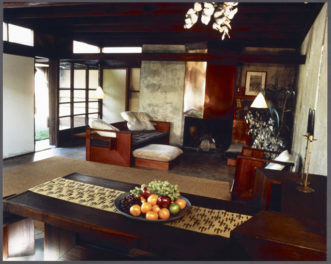 Your explanation of the good and bad effects of patinas with pertinent images was so helpful to me. 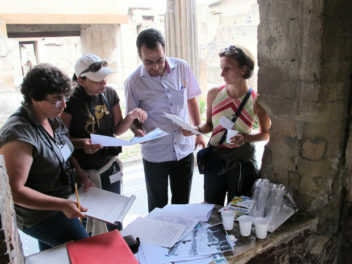 Your article was easy to access, interesting to read, due to the array of details included, and has the authority of your experience working to conserve ancient objects. I am teaching an introductory course in Humanities and I appreciate your sharing this! Many thanks!! Bronze Statues and sculptures are well known to be used in temples since chola periods in south India. Bronze is used in massive sculptures as well as statues with minute decorative details in them. Well known for its durability to retain its structure for long makes bronze a preferred choice for sculptures in open display. Thank you for posting this. It is very helpful for me. One question if you please? I have a few ancient bronze pieces in my collection. Can the green malachite be cleaned with acetone or better left alone. I did a test spont on one piece with acetone & a q-tip. I was able to pick up some green color, is that normal?